From family breakfasts to cocktails to holiday dinners, everyone seems to congregate in the kitchen. So it only makes sense that the flooring you choose for your kitchen could be one of the most important decisions you make in your home. It will have to handle everything from spills to a dropped pan of your famous lasagna, so it needs to be durable. The kitchen also tends to be a gathering place for everything from Sunday morning pancakes to dinner parties. So, you’ll want it to be a space you love and are proud to show off. And when it comes to selecting your new kitchen floors the choices can seem endless. 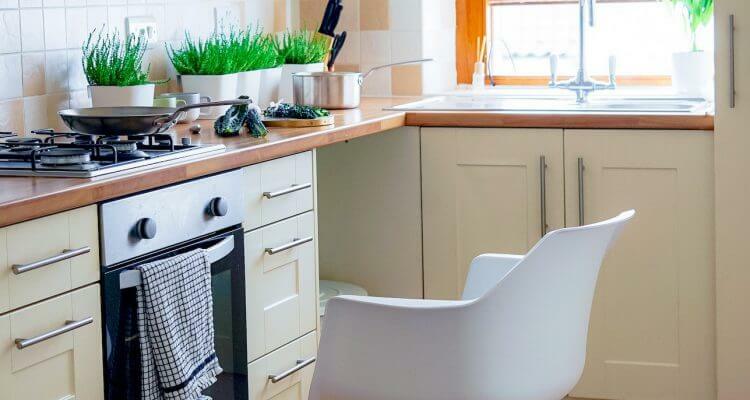 That’s why we’ve put together a guide to help you find the ideal kitchen flooring for your home. The kitchen floor sets the stage for the style and function of your kitchen. When deciding on the type of floor to choose, consider things such as comfort, ease of cleaning, lifestyle and of course, your sense of style. Do you spend hours in your kitchen prepping meals and trying out new recipes? Then you’ll want something that is soft and warm so hours of standing and letting your inner chef out won’t wreak havoc on your back. Does the thought of daily mopping and sweeping have you feeling exhausted before you even pick up a broom? Select a floor that is easy to clean, stain resistant and won’t show every little crumb. Do you have kids and pets that seem to spend most of their time and energy under your feet in the kitchen? You’ll definitely want something durable that can stand up to messes, toys and of course, daily games of tag. Did we mention you’ll probably want something non-slip too? And last, but certainly not least, think about your sense of style. Just because your kitchen needs to be functional, doesn’t mean it can’t look stunning. Are you on the hunt for something sleek and modern? Maybe you’re more the sophisticated and understated type. Or perhaps your taste skews rustic with some character? 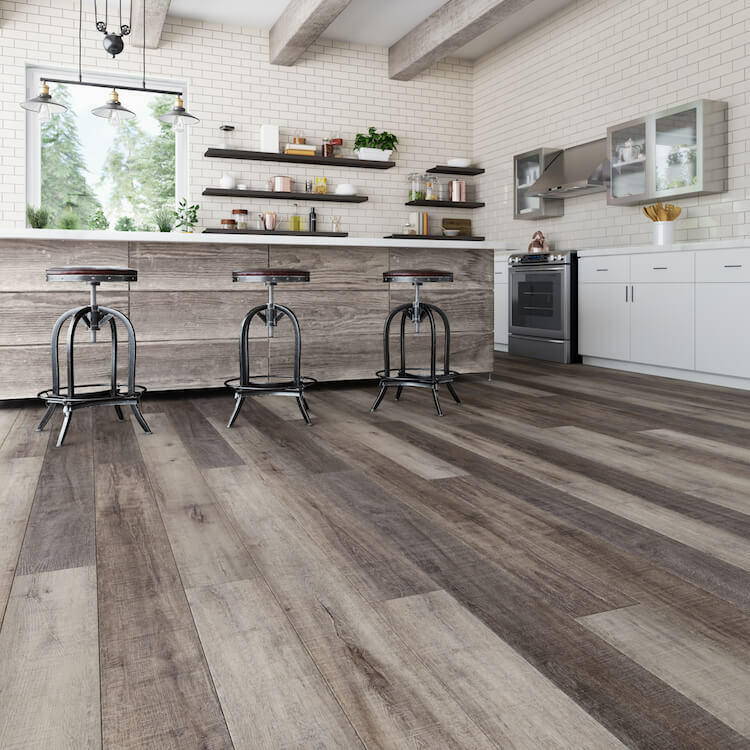 From vinyl to cork to laminate, TORLYS has the types of flooring, colours, and styles to transform your kitchen floor into the space you’ve been dreaming of. An excellent choice for kitchen flooring, EverWood Designer is warm to the touch and comfortable underfoot. It’s resistant to water, mold, and mildew so it’s great for under appliances and won’t be phased by water drips from doing the dishes in the sink. Its 0.5mm wear layer makes it extremely durable so it will maintain its great looks no matter how busy your kitchen is. EverWood Designer luxury vinyl plank is also dent resistant, quiet (so late night fridge snacking can stay your little secret), and very easy to maintain. This collection has the longest and widest planks along with trendy styles and realistic textures. EverWood Designer has 4-sided finished bevels and boasts a contemporary colour palette. Those with modern taste will find it easy to incorporate into their kitchen. Tip: While vinyl might seem easy to install yourself, a professional installer will make sure you fully reap the waterproof benefits of your EverWood floors. Nothing screams kitchen flooring quite like tile. But traditional tiles can be cold, must be installed on a perfectly level surface and can’t always withstand the crashes and bangs that kitchens are prone to. With EverTile Premier luxury vinyl tiles, you get the look of tile with a durable surface and much more practical choice for kitchens. It’s also resistant to water, mold, and mildew so spills or a leaky dishwasher won’t bother it one bit. Our EverTile Premier floors have an attached CorkPlus™ underlay, which makes them softer underfoot than ceramic tiles. They also come equipped with Microban® antimicrobial protection, so you don’t need to worry about germs growing in and under your floors. It’s quiet and warm underfoot so you can enjoy your kitchen without having to wear slippers all the time. EverTile Premier is also dent resistant, hypoallergenic and amazingly easy to maintain and keep clean. These tiles are on-trend and come in a range of colours and textures so there is most definitely a tile for your style. Thinking about getting a little creative? Here are some kitchen flooring ideas from Pinterest. Cork is becoming an increasingly popular choice for kitchen floors. It’s not only a stunning, but you can feel good about your purchase too. Cork is recognized worldwide as a floor with unsurpassed environmental advantages. TORLYS Cork Florence Premier is FSC® (Forest Stewardship Council®) certified, ensuring your floor meets strict environmental standards. Cork is naturally antibacterial and the CorkPlus™ attached underlay with Microban® antimicrobial product protection take this choice to a whole other level. It’s also suited for installation below grade, over radiant heated subfloors, over concrete and even over some existing floors. This is ideal for a speedy renovation or a kitchen in a basement suite. Cork floors have long been cherished for their striking looks, natural warmth, and eco-friendly attributes. But unlike traditional cork floors, Cork Florence Premier from TORLYS has our very own Smart Finish for increased durability. Tip: Add a bit extra to your flooring order so you have replacements should a tile become damaged down the road. Do you want the warmth and sleek look of hardwood floors in the kitchen but you’re not sure traditional hardwood is up to the job? Our Envique laminate floors will give you the look of hardwood but will wear like laminate. This waterproof collection features 24-hour spill protection, making it the perfect floor for a messy kitchen. You won’t have to worry about spilt milk when you install TORLYS Envique laminate floors! 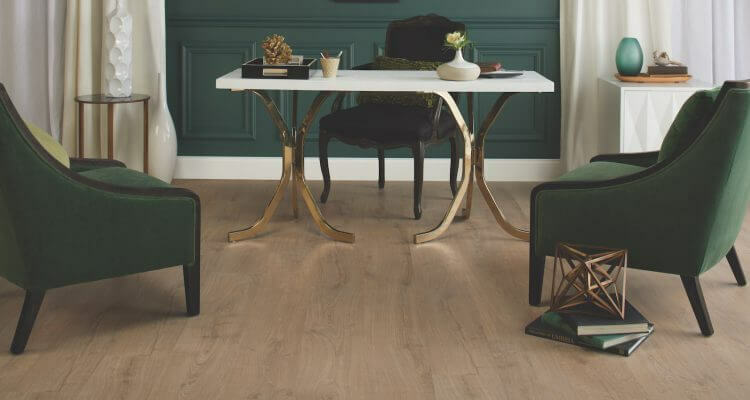 Later in 2018, the waterproof features of Envique will expand to other laminate collections. This benefit is not going away any time soon! 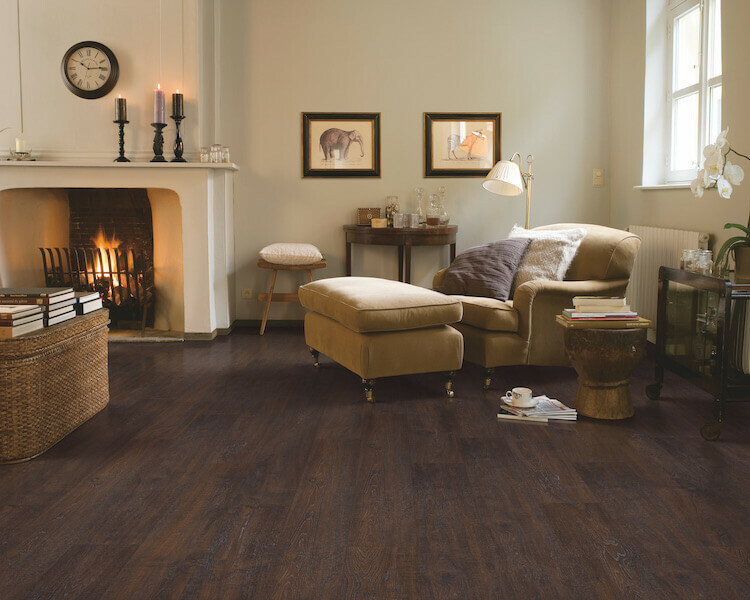 Our Envique laminate floors can be installed transition-free up to 50′ x 50′. This means that you can install it seamlessly from your kitchen through to your dining room, making it perfect for an open concept main floor. Tip: For extra cushioning when standing, install the recommended underlay to ensure durability and comfort. There is no “best flooring” for a kitchen, but there are certainly options that are better than others. At the end of the day, the choice you make for your kitchen floor should combine form and function. 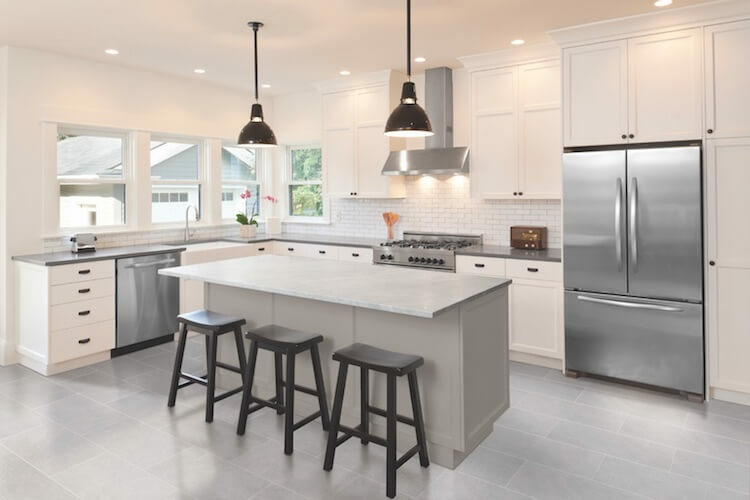 With the number of quality kitchen flooring options available, you should never have to sacrifice looks for durability and practicality. Find your nearest TORLYS dealer and talk to them about your kitchen flooring needs. They’ll be able to help you pick the right material and look for a kitchen that will look amazing today and for the years to come. Hardwood vs Laminate Flooring: Which is Best for You?